Darn you lulu! I’m still operating with March budget but am looking at new ‘Aprilish’ items. 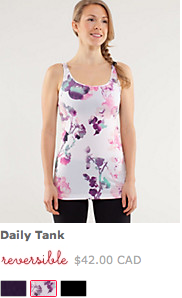 Of course I ordered the Daily Tank in both Heathered Concord and Blurred Blossom. I haven’t seen them in store yet so it’s still a try on and see but I’m hopeful I’ll like one of them at least. I wish the Concord Grape was solid. Seriously? A bra with 7 hidden pockets? 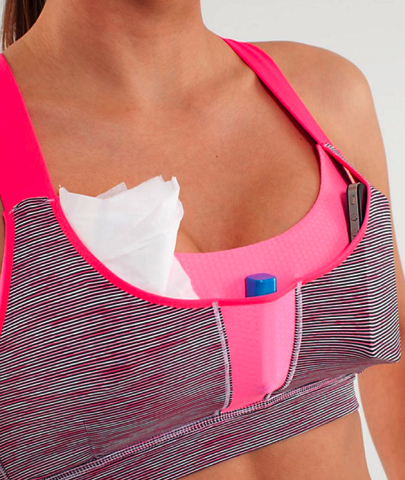 Great idea but my grandmother managed to stuff her bra with all sorts of things (tissue, cash, lotto ticket, werther’s original etc) and her bra didn’t even have built in pockets. Definitely interested in trying this one on…but I’m growing an aversion to the uniboob sports bra look so no matter how clever the bra is, uniboob would be a deal breaker for me. Forget uniboob, this is a whole other problem. Can you imagine running a race with your bra stuffed like this? You’d look like such an idiot but also you’d be in pain. Although I would actually be the person to stuff her phone in her bra probably. I’ve done it before with my stop watch before I had a garmin. Imagine those pocket dials. 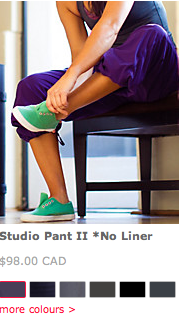 Concord Grape Studio Pants. 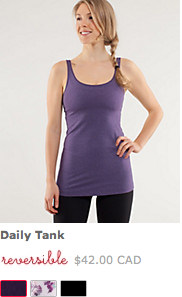 I may have been more tempted in Crops. 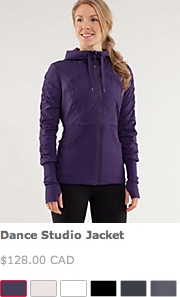 Concord Grape in the Dance Studio Jacket is totally tempting me. The color looks so gorgeous in this jacket. 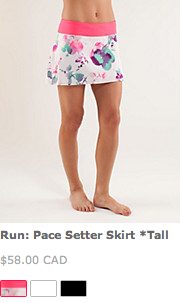 I was hoping that the black Jacquard Print Pacesetter Skirt would come in a tall length today but no such luck. "Concord Grape Studio Pant Color Comparisons"
"The Latest: Daily Tank, Dance Studio Jacket, Yoga Camp Pant, Blurred Blossom, Concord Grape Dance Studio Pantsand More"